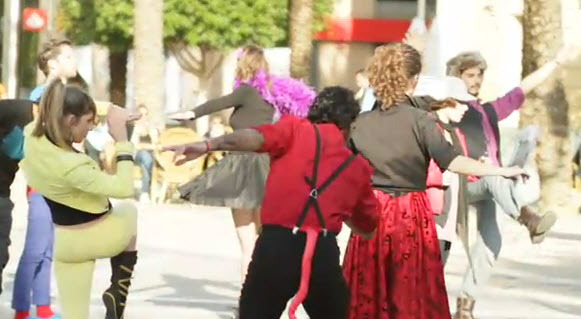 When is a slow motion flashmob not a slow motion flashmob? When it's recorded in slowmotion and then played in fast forward on YouTube. Which is just what Samsung did to tout the iPhone look-a-like Galaxy Ace. In the streets of Jerez, dance troupe Colectivo De Arte were filmed doing various movements...very slowly as onlookers wondered what was going on. WHen the filming is viewed sped up, the end product resembles a stop motion film. Nifty.